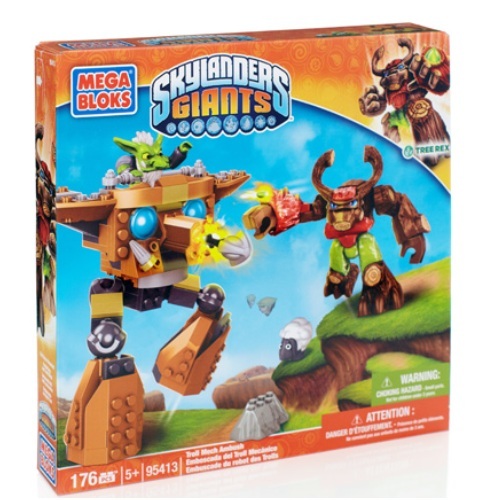 Product Detail Summary: Build a battle of epic proportions with the Troll Mech Ambush by Mega Bloks Skylanders GiantsTM! The buildable, troll-piloted Gun Snout mech can fire off missiles with its working launcher. This towering menace can cause big trouble for Tree Rex, but his colossal strength allows him to counter-attack with the included boulder! Features: • Buildable mechanical walker with working launcher • Buildable troll enemy • Buildable Tree Rex (Life Giant) with boulder • One sheep • Combine with other Mega Bloks Skylanders Giants sets to build your adventure!